If you are interested to watch, the video is live online through 16 February. I received a number of emails and other messages from around the world after the initial broadcast on 2 February. It’s always nice to get positive feedback. It’s one thing to get comments and encouragement from friends and people I know who are involved in the nature/ underwater/ conservation community. It’s even more valuable to me, however, to reach outside that community. Reaching people who are already nature lovers, people who already have seen and understand the issues facing the natural world, is certainly important. If we are to change the world for the better, we have to address and engage everyone, not just those who happen to already be on our team, so to speak. This is the main reason I concentrate the bulk of my efforts on addressing audiences outside of nature publications, dive magazines and such. 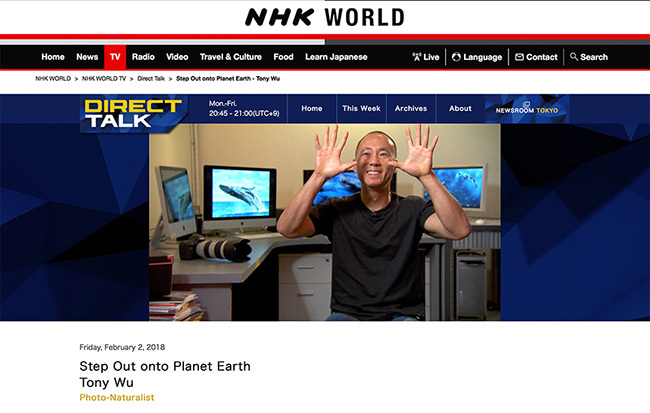 In a perfect world, I’d like to do everything, but with limited time and resources, I devote my efforts to things like public talks at schools and for general audiences, and whenever possible, working with general media, with recent examples being NHK World and Days Japan. If you really want to make a difference, step outside the comfort zone where everyone agrees with you, and take on the challenge of influencing people outside the nature community.